South Africa will host the next Champions League Twenty20, to run from September 10 to 26, the tournament's organisers have announced. The tournament chairman Lalit Modi confirmed the decision, following a board meeting in Mumbai where it was formally agreed to accept Cricket South Africa's invitation to stage the event. However Modi, under immense scrutiny over the ongoing IPL mess, was not present at that meeting, which took place at the BCCI headquarters on Saturday. "South Africa is considered an ideal CLT20 host after successfully staging the Indian Premier League and ICC World Twenty20 tournaments in recent years, as well as the strong support shown for its domestic Pro20 Series competition," said Modi via a press release. The venues and competing teams for the second edition of the Champions League will be announced in the near future, said the tournament management. The first edition of the tournament was held in India last year. 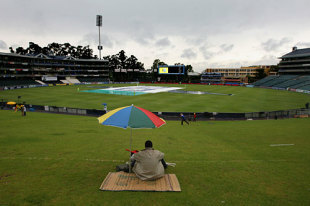 South Africa had hosted the IPL in 2009, after the tournament was moved out of India as it clashed with the country's general elections. The decision puts to rest the speculation that surrounded the Champions League earlier this year. In February, CSA had announced that South Africa had been finalised as the venue for the tournament, only for Modi to quickly clarify - via Twitter - that the statement was inaccurate. Despite the dates for this season's edition having been announced much earlier, there had been press releases from CSA and the Champions League itself stating that, like in 2009, 12 teams will take part from seven full member countries, including England. Gerald Majola, the CSA chief, had confirmed the news to Cricinfo earlier in the day while Dean Kino, head of the league's Governing Council, had on Friday stated that a decision regarding the appropriate participating countries was taken each year as policy. The Champions League features the best domestic Twenty20 teams from across the world and is run by by the boards of India, Australia and South Africa with its governing council comprising representatives from each board. Other countries participate in the tournament by invitation, but Pakistan and Bangladesh are the only two Test-playing countries with no presence in the tournament. Pakistan had sent a representative in the first edition of the tournament, which was cancelled in the wake of the Mumbai terror attacks in November 2008. As ties worsened between India and Pakistan and their cricket boards in the aftermath, the PCB was not eventually extended an invitation to the first tournament and since then it has stated that it will not send a team this year after Pakistan players were not included at the IPL auction in January. The dates of this year's Champions League clash with the end of England's county season, which finishes on September 16. At the same time, England and Pakistan will be contesting an ODI series that runs until September 22.